With grief I have heard about the demise of the Rev. 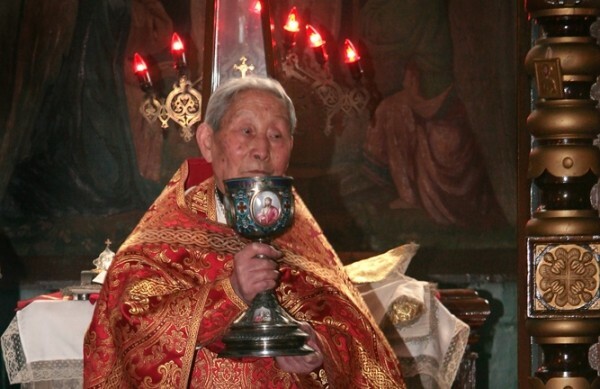 Michael Wang, the oldest priest of the Chinese Orthodox Church. Please accept me profound condolences. Rev. Wang had received the grace of priesthood from Bishop Simeon of Shanghai over fifty years ago and, keeping faithfulness to Our Lord Jesus Christ and His Holy Church even during hard times, shared sorrows and joys with his flock. By God’s Providence he participated in the process of the revival of Orthodoxy in China. Having conquered his illness and advanced age, he consecrated the church in Erguna and assisted in training new Orthodox priests. I keep my heart’s reminiscences of concelebration with him in the Cathedral dedicated to the ‘Helper of Sinners’ icon of the Mother of God in Shanghai in May 2013. May the All-Gracious Lord rest the soul of His newly departed servant in the mansions of the righteous and grant him eternal memory.